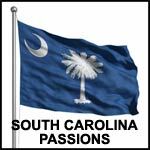 My parents were from SC I moved to SC IN 1982 and have been here ever since. Living in Carolina is Cool Carolina is a nice state and since I have been here I have learned to like it. Looking to learn more about Carolina and what activities are availabl here.